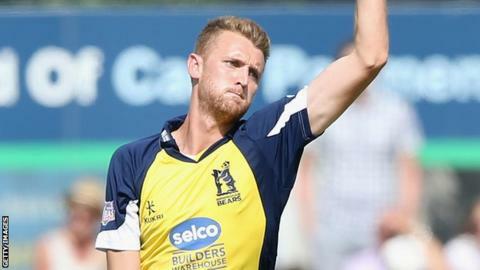 Warwickshire paceman Oliver Hannon-Dalby took a career-best 5-27 as last year's One-Day Cup finalists beat Glamorgan by nine wickets at Edgbaston. After electing to bat, the visitors reached 53-1, but Hannon-Dalby and Josh Poysden (3-41) fought back to skittle them for 179. Opener Will Bragg top-scored for the Welsh county with 45 off 77 balls. Half-centuries from Varun Chopra (80 not out) and Jonathan Trott (73 not out) then saw Warwickshire to 183-1. Earlier, Glamorgan looked set for a much bigger total, but Hannon-Dalby tore through the middle-order as they lost five wickets for 55 runs to slump to 108-6. Some lower-order hitting from Craig Meschede (23) and Michael Hogan (17 not out) gave the visitors something to defend. But Bears skipper Chopra and Trott made light work of the chase with a stand of 157 as they got home with 11.5 overs to spare. "Having played on that wicket it was quite a decent wicket so to only post the score we did is quite disappointing. "We're not getting off to good starts and I myself would like to score a bit more runs. You're always going to struggle if you don't get off to good starts. "I think it's time for the batting unit to sit down again and be accountable about performances. It just hasn't been good enough."